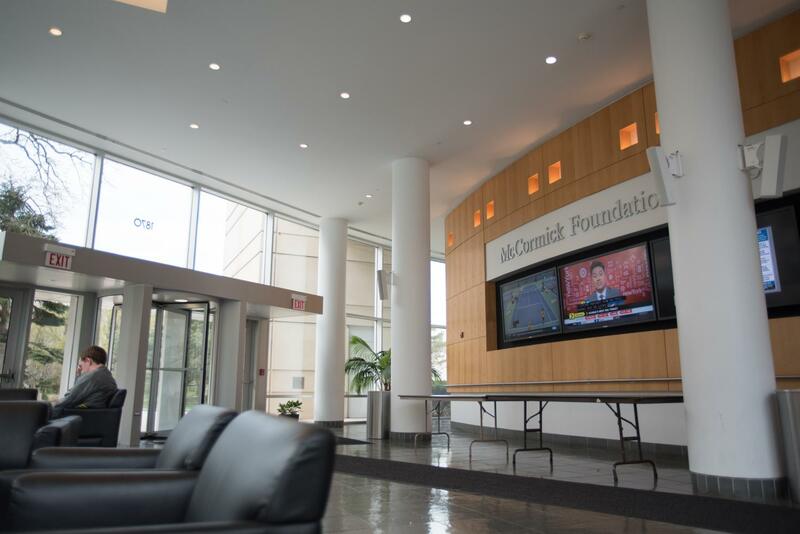 The McCormick Foundation Center lobby. The Medill School of Journalism will no longer be reviewed by the Accrediting Council on Education in Journalism and Mass Communications. The Medill School of Journalism, Media, Integrated Marketing Communications is not reapplying for accreditation under the Accrediting Council on Education in Journalism and Mass Communications, an international organization that evaluates journalism programs in colleges and universities. Medill Dean Brad Hamm told The Daily the school’s administrators no longer agreed with the terms imposed by the accrediting organization. Hamm said in a statement that the move was motivated by concerns regarding ACEJMC’s leadership, transparency, and the strength and expediency of its review process. The University of California, Berkeley also decided to not reapply for accreditation this year, Hamm said. “By not continuing to be a part of this group, we’re saying that we’re very hopeful that all schools have a better model going forward because we have a great interest in all of journalism education,” Hamm said. Accreditation terms, Hamm said, run six years. Instead of being reviewed by the ACEJMC, Medill will conduct a self-study beginning in July and will bring in “national leaders in our field” who will examine the school. Northwestern as a whole is still accredited by the Higher Learning Commission, which according to the University’s website is one of six regional accreditors in the U.S. In an email to The Daily, ACEJMC executive director Susanne Shaw said Medill announced its decision to not apply for accreditation last summer. Medill Prof. Mei-Ling Hopgood, who used to represent the Asian American Journalists Association in the ACEJMC’s accrediting council, said she was removed from the council after being told ACEJMC rules do not allow educators from non-accredited schools to serve on it. She was also told the council did not plan to fund representatives of AAJA, the National Association of Hispanic Journalists or the National Association of Black Journalists. Members of the council must pay a fee to be represented, and Hopgood said organizations representing minority journalists usually can’t front the costs. For some years, these positions were paid for by a grant, but that grant seems to have run out, she said. This, she said, is worrisome, because minority journalists must be represented in these kind of organizations. “It’s an imperative that we look … nationwide that journalism schools and communication schools are diversifying their faculty, their enrollment, their support for students on campus of different diverse backgrounds,” Hopgood said.